unique in the art world. They are two artists with one vision, working side-by-side on the same canvas. This talented couple met in Florida and married in 1987. Wendy, a Wisconsin native and daughter of a dairy farmer, longed to return home. When her father retired in 1988, the couple moved to Wisconsin and purchased his farm, maintaining several buildings for use as a studio and gallery. Nestled in the rolling hills of Trempealeau County , just north of Whitehall , their farm is in one of the least populated areas of the state. This retreat allows them the solitude to be creative. Although they are represented by the largest privately-owned gallery in the U.S. , the artists established a gallery of their own on the farm. It is open to the public and contains a rotating collection of their original oil paintings and fine art editions. Their collaborative works have been displayed in some of the nation's largest galleries alongside such noted artists as Peter Max, Salvador Dali, Picasso and Rembrandt. 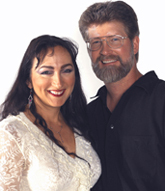 The Wisconsin Foundation for the Arts selected Schaefer/Miles as their commissioned artists in 2003. This prestigious honor afforded them the opportunity to hang one of their elegant oil paintings in the governor's mansion. It has been placed in the permanent collection of Madison's Elvehjem Museum . The couple attributes their phenomenal success to the joy and love they have for their craft. "We've been blessed to share our passion for painting and we're more excited about it now than when we started. Our work has become bolder, more colorful, and hopefully more engaging to the viewer." The myth of the tortured artist struggling in isolation does not apply here. Husband and wife painting team Wendy Schaefer-Miles and Kevin D. Miles are a unique phenomenon in the art world. Married in 1987 this talented couple began their collaboration a year later. The public's acceptance of the artists' unique working arrangement was immediate. The artists' works have been in great demand. Their vivid landscapes have captured the imagination of collectors around the world. Last year alone this prolific team painted and sold over 100 original oils. An amazing feat considering the amount of time the artists commit to traveling. Wendy and Kevin's inspiration comes directly from nature. Their paintings are a travelogue inspired by beauty. In a time when America is looking for inspiration this dedicated team has spent the past decade portraying and sharing the grandeur of the American landscape from the tropical Gardens of the South to the rain forest of the Pacific Northwest. The small villages of Rhode Island to the deserts of the Southwest. Most recently the artists have focused their highly trained eyes on the magnificent splendor of the Rocky Mountains . The paintings Wendy and Kevin produced while on their last expedition there were snapped up before they were dry. To what do the artists attribute this phenomenal success? Schaefer/Miles as the couple is known, can only say that it comes from the joy and love they have for painting. The artist's take the viewer on a journey to a world filled with light void of stress and anxiety, a place we all desperately need in times of trouble. Schaefer/Miles works have been widely published and are viewed and appreciated by over 7 million people a year. With distribution in over forty countries around the world the artist's popularity continues to grow. Despite this amazing level of exposure Wendy and Kevin have shunned media attention. When the somewhat private artists aren't searching for new inspiration they hold up on their farm in the rolling hills of Western Wisconsin , located in one of the least populated areas of the state, this retreat allows the artists the privacy to be creative. The beauty of the surrounding countryside is often featured in the artists' works. Even though the artists are represented by the largest privately owned gallery in the U.S. Schaefer/Miles has established their own gallery on the farm, a destination for serious collectors that have searched them out. The artists now have a full staff to cater to the desires of their collectors. The gallery features a rotating collection of new originals and many of the artist's fine art editions. Wendy & Kevin's newly revised website, www.schaefer-milesfineart.com has become a new venue for the artists to share with their audience. The colorful website lets the viewer take a sneak-peak inside the artist's studio. Only a handful of collectors have ever been allowed in the artists' inner sanctum. Wendy and Kevin's private sanctuary is shared only by their two young daughters and a menagerie of pets. The website also features a virtual gallery where potential collectors can view a selection of the artist's recent works. When asked what the artists see in their future their reply is gracious and immediate. "We've been blessed to share our passion for painting for twenty years and we're more excited about it now than when we started. Our work has grown and matured over the years. It's certainly become more bold and colorful and hopefully more engaging for the viewer."